In Guns, Gore and Cannoli, you play Victor Cannoli, a mob enforcer tasked by his bosses with going to Thugtown to find and bring back an informant... or something. Look, let's be honest, this game has a wafer-thin plot, and "go to Thugtown" is apparently the best reason the development team could come up with as an excuse to shoot at zombies. 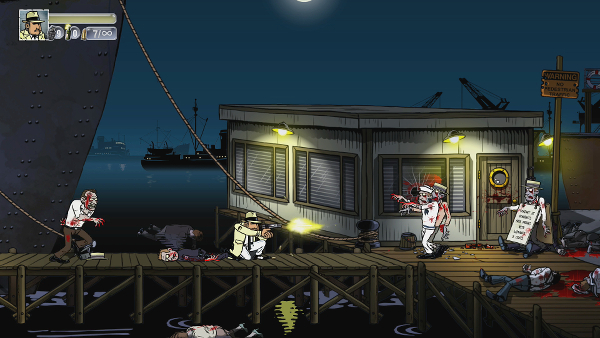 Guns, Gore and Cannoli looks really nice with its hand-drawn graphics. And the controls are usually quite smooth. It even has local four-player co-op, which is definitely a rarity these days. (No online co-op, though, unfortunately.) Regrettably, that's pretty much where the good things end. I appreciate what the developers were going for—a classic side-scrolling shoot-'em-up—but the product they offer is just so incredibly generic. So let's start with the good. Obviously, the graphics. Just look at them: they're really smooth. OK, they aren't exactly on the same level of complexity as, say, Destiny's Martian battlefields or Battlefront's snowdrift-covered Rebel Alliance base, but Guns, Gore and Cannoli's graphics are still as slick as the grease in a 1920s gentleman's hair. It looks professional, but still retains the classic independently-developed Flash Player game look. The controls are quite good, too. They're responsive, although when you move it does feel like your character slides around a bit before stopping—actually, kind of like what often occurs in Flash-developed games. Shooting is easy and intuitive, as it should be in this type of game, and reloading is accomplished by tapping the right bumper button. Unlike some other similar titles, you will really want to make sure all of your weapons are fully loaded up between firefights; when enemies attack in Guns, Gore and Cannoli, they tend to attack in large numbers that can easily overwhelm the unprepared player. But the biggest problem with the controls is readily apparent whenever stairs are present in the game. In other games, you can 'jump down' a level by, for example, pressing the down and crouch button simultaneously, so if you accidentally go up a set of stairs, getting down to the lower platform is no trouble at all. However, Guns, Gore and Cannoli, to my knowledge, has no such similar feature. In fact, it's pretty much impossible to tell where the detection area for stairs begin: so if you find yourself inadvertently traveling diagonally upwards, the solution usually involves wandering back down the stairs, out a bit, turning around, walking back and... nope, still going up. Go back down the stairs, wander a little further out, turn back... nope. Go back down the stairs, go back halfway into the previous screen, turn around, and walk back... finally, I'm staying on the lower level. It's just annoying more than anything else, but it feels like the game is just wasting my time in that instance: it could have been fixed easily. Finally, I appreciate the diversity of enemies in the game. But the problem is that the game throws them at you constantly, very quickly, without much introduction. As new enemy types are introduced, they rarely appear on their own, and they're soon followed by another new type of enemy. Okay, this makes it more challenging to deal with groups (when you have sprinters, chargers, shamblers, armored, and firearm-wielding zombies all appearing at nearly the same time), but the quick jump means you have no time to figure out the best strategy for dealing with particular types of enemies. So rather than actually trying to figure the game out, your solution ends up being to pull out the Thompson sub-machine gun, shoot everything as soon as it appears, and kick anything that gets close to you. To me, that sounds less like a fun game, and more like a shortcut to carpal tunnel. Unfortunately, my opinion of this game is that if you've ever played any side-scrolling shoot-'em-up platformer in the past, say, fifteen years, then you've pretty much experienced what Guns, Gore and Cannoli has to offer when it's at its best. 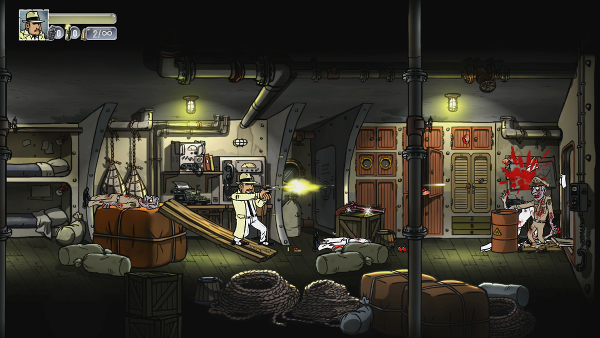 It would be an amazing game if it were a browser-based Flash game with a pay-what-you-want scheme, or as a project on Steam Greenlight, but as a console game... it's kind of underwhelming. And the lack of online cooperative play is rather disappointing, as it might help alleviate some of the stress of being constantly bombarded with enemies from all directions. The Finnish developers behind the well-received Neon Chrome come back with another top-down twin stick shooter. At a quick glance, you'd be forgiven to mistake Time Recoil for some Neon Chrome DLC, but it turns out the game has an identity of its own. Time Recoil isn’t as much a blast fest as it is a thinking man’s shooter. At times, it could almost pass for a game of chess - deadly chess with bullets, explosions and time-warping super powers. Where does the line get drawn between something being an endearing parody of real life or an obnoxious stereotype dunked on for laughs? Guns, Gore and Cannoli 2 rides that line harder than any game I have ever played, and I think manages to stay on the positive side through some great gameplay and sheer force of will. Barely though. Just barely.